In Valcea County, close to the road connecting Ramnicu Valcea and Targu Jiu, 8 km far from Horezu, on the land of a small village named Costesti, there are some fascinating and mysterious stones, called Trovants, which are believed to have a life in them. The trovants (concretions) are geological phenomena which consist in spherical shapes of cemented sand, appeared due to some powerful seismic activity. The earthquakes that led to the creation of the first trovants are supposed to have taken place 6 million years ago. The stones can also take cylinder and ellipsoidal shapes, in which case they resemble the number 8. Their strangeness comes from the fact that, although they vary in size, from a couple of millimeters to even 10 m, they are very similar, taking into account a natural law that states there are no such things as identical stones. Despite their efforts, the scientists have no logical explanations to a couple of facts: although imperceptible for the human eye, the trovants grow in size after they come into contact with water; their number has increased in time; they have some extensions many consider to be roots; if they are cut, their sections have colored rings, just like trees. The locals call them ”living stones”, “dorobanti” or “balatruci”. 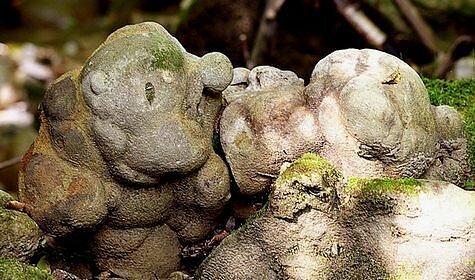 They think these stones are living organisms that grow after it rains, that it is better to speak nicely to them, otherwise you’ll have headaches, or that they are relics of some extraterrestrial civilizations which visited Earth long ago. As a result, the villagers place trovants in their gardens and on the tombs of their loved ones and many tourists didn’t hesitate to steal some from the open air museum that is supposed to preserve them. The trovants geological phenomena can also be found in other parts of the world, such as Bosnia, Czech Republic, Russia, China, New Zeeland, Canada, USA, Mexico or Costa Rica. Valcea County is not the only place in Romania where trovants can be found. 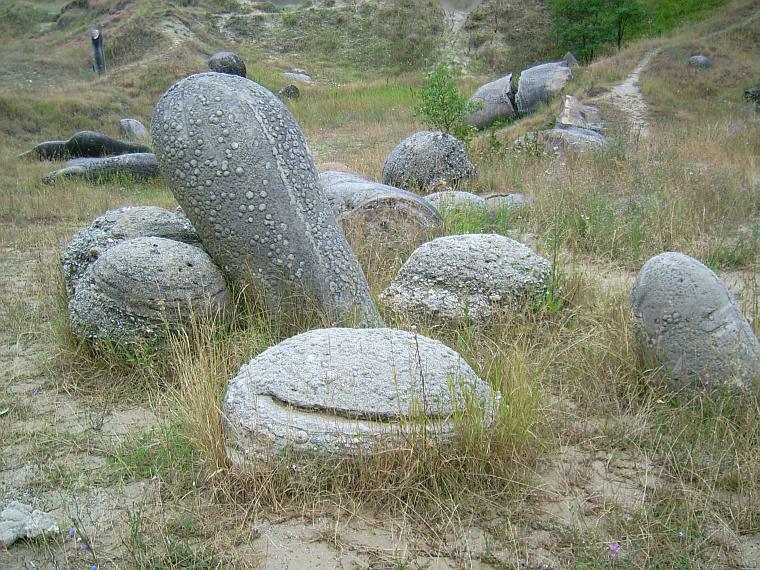 The Feleac Hill in Cluj-Napoca is the place of a beautiful legend, in which the stones are named “Feleac’s eggs”.